Accessorize your patio, deck, pool side, or garden with a beautiful and practical patio umbrella. This stylish Huge patio umbrella comes with a steel frame, crank lift and height adjustment feature. 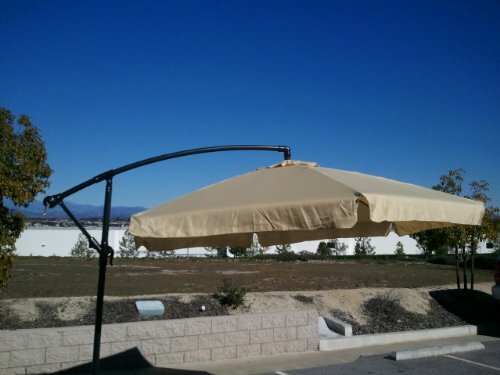 Product Information: 10 Ft. Tan Offset Umbrella. Polyester top cover Treated with water repellent fabric protector. Auto Crank lift and Tilt Feature Light weight and sturdy construction. Air vent Polyester top cover. Pole Diameter 1 7/8 Inches. Light weight and sturdy construction, Air vent Polyester top cover. Pole Diameter 1 7/8 Inches, Stand Included. If you have any questions about this product by Petra Imports, contact us by completing and submitting the form below. If you are looking for a specif part number, please include it with your message. Stainless Steel T316 Heavy Duty Awning Canopy and Shade Sail Hardware Installation Kit - 3/8"